We do not curently have theatre tickets available for Around The World In 80 Days This could be because we have simply sold out or it could be that this show is no longer running. The information on this page remains purely for historical and informational purposes. AROUND THE WORLD IN EIGHTY DAYS swaggers its way around the globe, taking in continents, intrigue, love, a hot air balloon and even an elephant  all in the name of a bet. 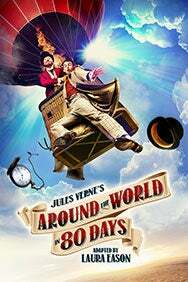 The ever-so-slightly stuffy Phileas Fogg wagers his life’s fortune that he can circumnavigate the globe in just eighty days with his wily travelling companion lieutenant Passepartout.